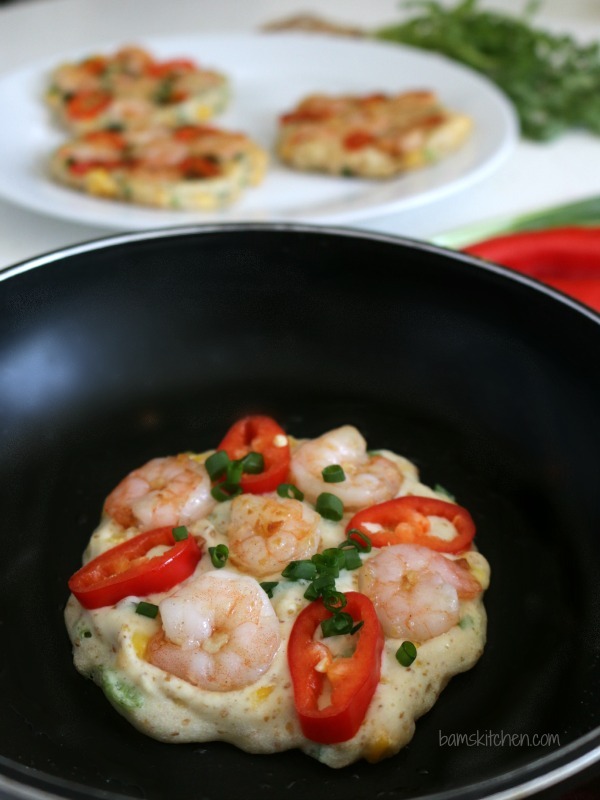 Delightful gluten-free savoury pancakes with sweet succulent shrimp, ginger, scallions, chilis and a light and flavourful Thai Dipping sauce. 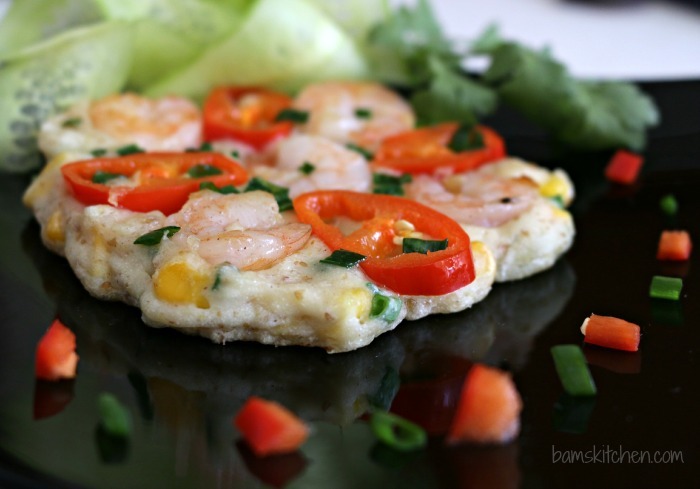 Thai shrimp pancakes are an explosion of flavour and textures in your mouth. With your first bite you are going to adore the zippy sour, sweet and savoury taste of the Thai dipping sauce. Then comes the aromatics and the crunchy texture of the shrimp, sweetness of the corn, slight crunch of the outer gluten-free pancakes and the soft and delicate interior of the pancake. I love the freshness of the spring onion and the heat of the chilis that brings this Thai Asian fusion food to a whole new level. 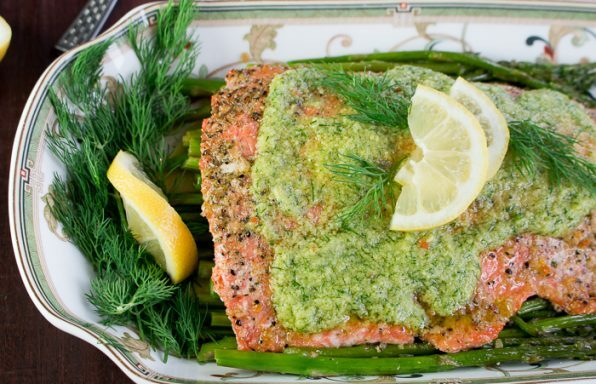 I know you are going to ask, well BAM, what make you think up this dish? Well pure craziness is the answer!!! It all started out with me missing the Chinese pancakes that are made with eggs as you know and shrimp, seafood and spring onions. I can't have eggs. So, then I started thinking about how I miss pancakes and when I was little my mom used to put corn in the mix. I know you are looking at me now like I have 3 eyes but you have to trust me you are going to love that crunch and extra sweetness. I thought to myself maybe I could combine both concepts to make Chinese Shrimp pancakes but was not overwhelmed with the results of adding soya sauce or rich oyster sauce to such a light and refreshing dish. 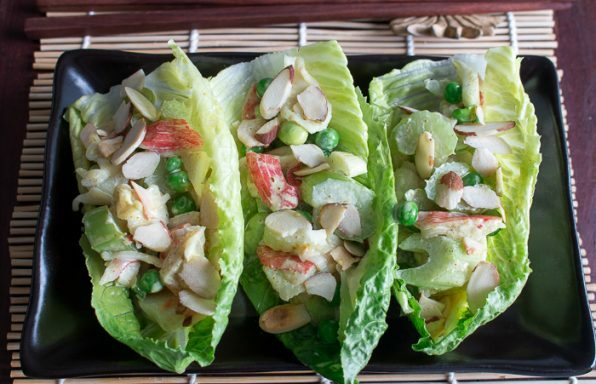 This dish needed lightness and balance so of course that is Thai. I could not be more pleased with the results. I only used a smidgen of coconut oil in a non-stick skillet to cook the pancakes and they were light and fluffy and savoury. 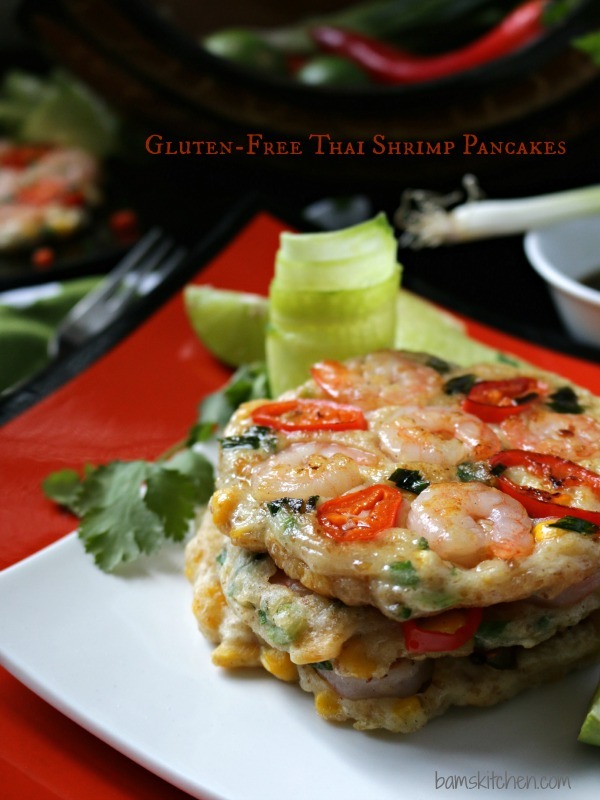 My Thai Shrimp pancakes are happily gluten-free, dairy-free, egg free and delicious. You could easily pass on the shrimp and just add more veggies for a delightful vegan version of this easy dish. I used a very modified version of good ole MOMables Gluten free pancakes and used one cup gluten-free all-purpose flour to one cup almond milk with a tablespoon of ground flaxseed for good measure and then made it savoury by adding fresh garlic, ginger, scallions, corn, salt and shrimp. Great gluten-free pancake base, thanks Momables! Thai dipping sauce is something you can find everywhere in Thailand. My boys love it so much they could do shots of it straight up. However it is much better over a Thai shrimp pancake, Shrimp Bundles or as a sauce for my Tropical Thai Swordfish . 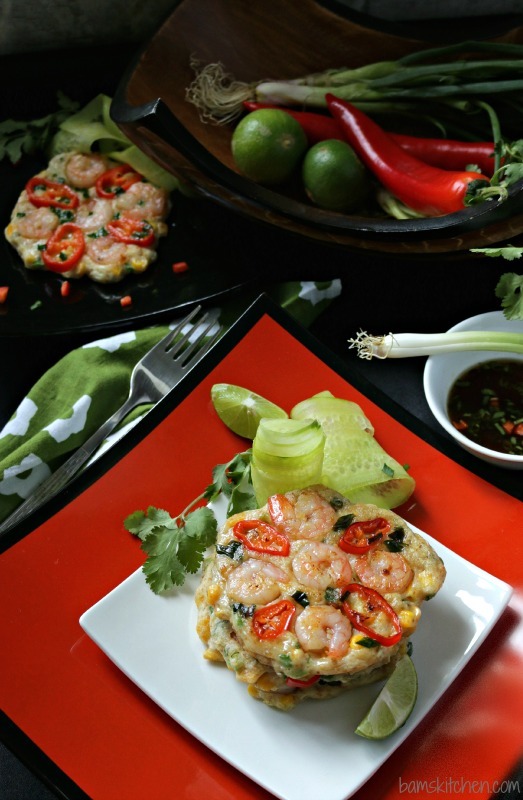 Thai cuisine is based over the balance of sweet, salty, sour and hot. 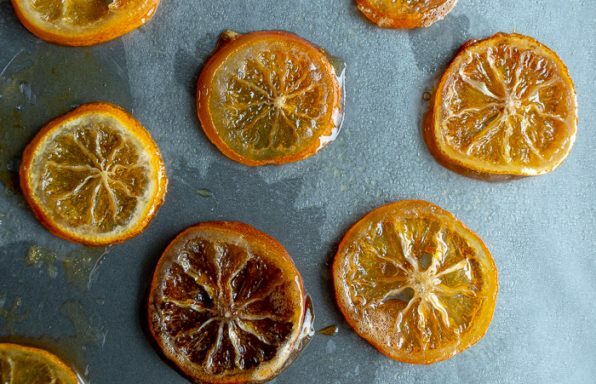 For the sweet, I used brown sugar as I figured that is something you probably have in your pantry but can also use more traditional palm sugar. For the salty, I used fish sauce and there is really no substitution for this lovely fermented fish flavouring. For the sour, I used fresh lime (but could use tamarind or even vinegar) For the hot and spicy of course it includes fresh chili peppers. (You can omit or just use a very scant amount to suite your liking.) Some fresh cilantro to give it a fresh taste and you are in business. This weekend I have one son extreme hiking on a 3 day adventure up the highest peak in Lantau Island. He is my super healthy kid who trail runs every day, loves fruits, veggies, but also a super big eater. He had to carry his tent, water supplies, camping gear and all of his food in a hiking back pack for 3 days. I don't know how he is doing as he is my son who could literally eat an entire hiking back pack of food in less than 45 minutes. I contemplate on that for a little bit with a little smile on my face while he is probably eating congee, survival grubs and power bars as I drizzle down the last little bit of sauce on my Thai Shrimp pancakes. Now as fun as that whole camping thing under the stars sounds, where would I be able to plug in my curling iron?!?! 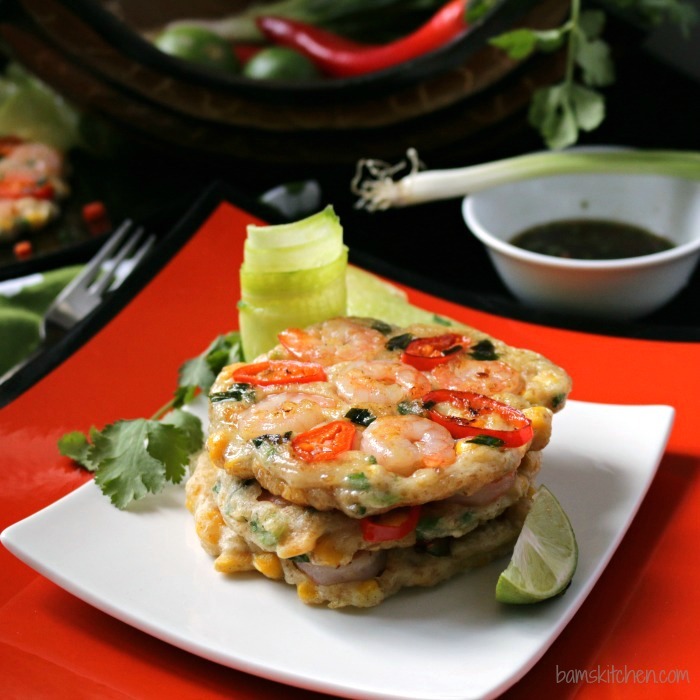 These delicious Thai Shrimp pancakes can be made under 30 minutes and are a delicious appetizer, lunch or a light dinner with a cucumber salad. I made the pancake mix and added the aromatics and corn and then took a spoon and made a flat circle and then decorated with my cooked shrimp, chilis and green onions to make a cool design. 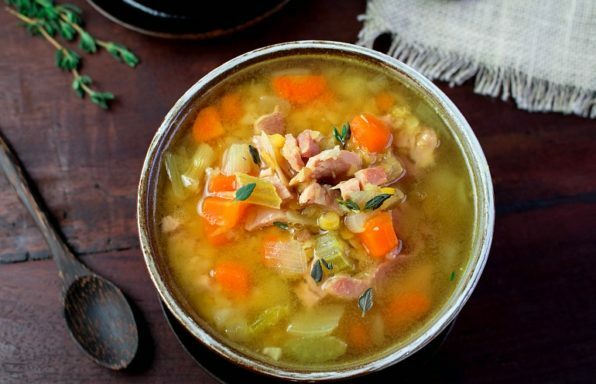 Have fun in your kitchen and wishing you a super week! 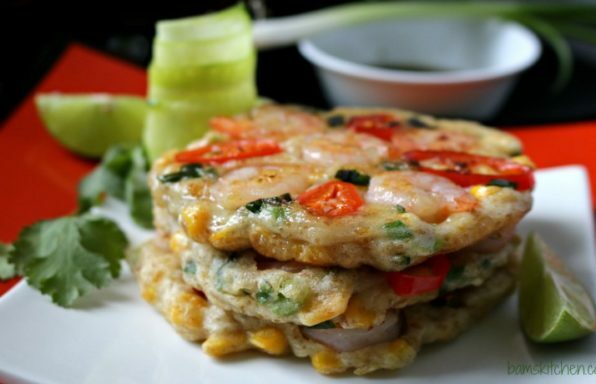 Delightful gluten free savoury pancakes with sweet succulent shrimp, ginger, scallions, chilis and a light and flavourful Thai Dipping sauce. 2In a little frying pan add 1 tablespoon of coconut oil and add shrimp and cook until pink. Season with a little salt and white pepper and set aside. Slice red chili or if want mild chop a little red bell pepper for colour and set aside. 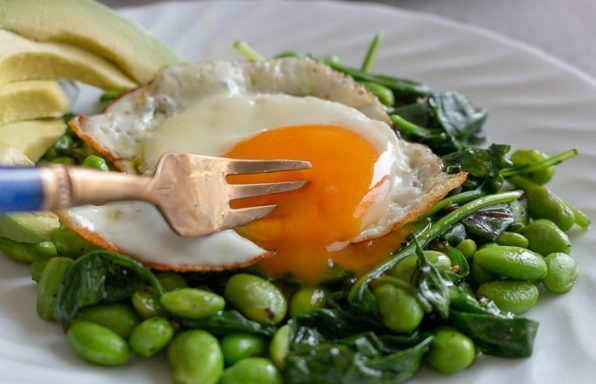 4In a frying pan heat up your coconut oil until medium heat. 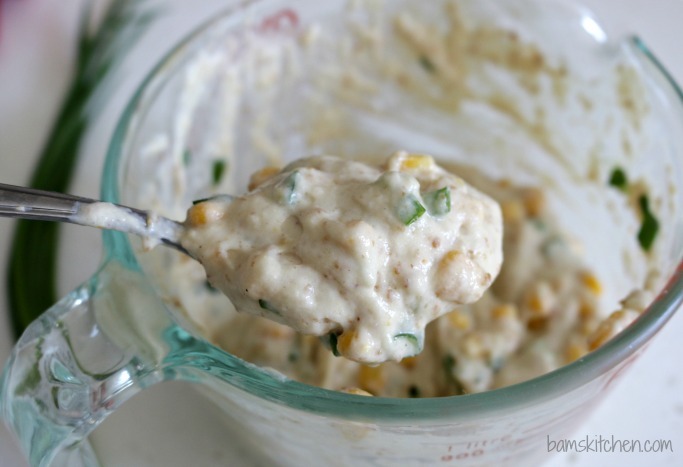 Add a heaping tablespoon of your savoury pancake mix and flatten into a circle with the back of your spoon. Artfully arrange the shrimp and chili on top of each pancake. Cook for about 2 minutes on each side until slightly golden brown on the outside and tender on the inside. Repeat for the rest of the pancakes. This recipe made about 8 medium sized pancakes. 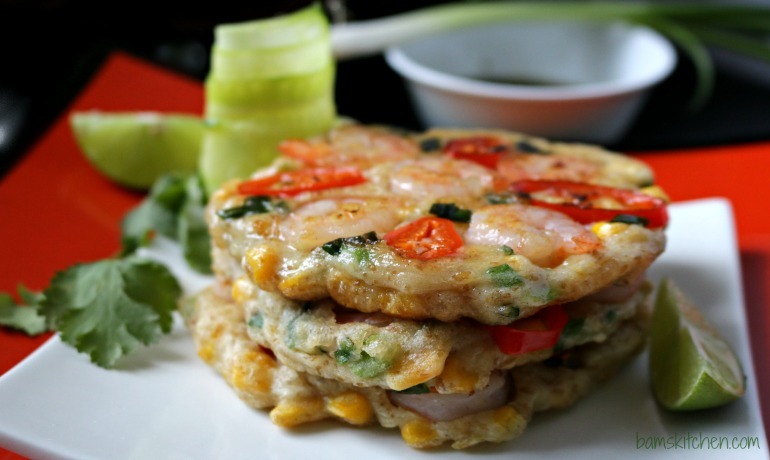 5Serve your delicious gluten-free thai pancakes with your thai dipping sauce and a light cucumber salad on the side. Enjoy!